In conservative Spartanburg County, pastors who worship alongside newly arrived immigrants soften their views on a thorny issue. SPARTANBURG, S.C. — Something is changing in the most conservative corner of conservative South Carolina. Some tea-party Republicans and evangelical Christians are softening toward immigration. 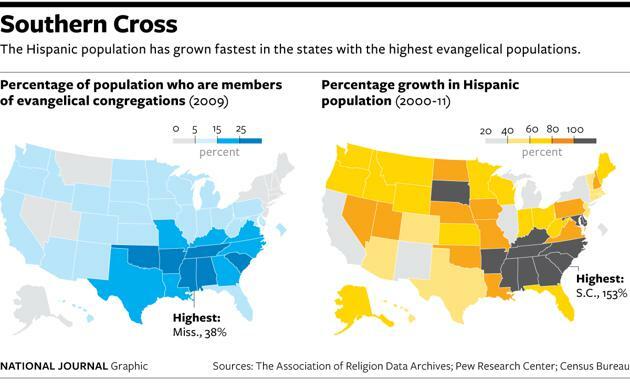 The Upstate region, around Spartanburg and Greenville counties, is home to more than 500 evangelical churches and a Hispanic population that has tripled in the past 10 years. It's a place where "amnesty" is a dirty word and where undocumented immigrants are often detained for driving without a license. But local farmers, church leaders, and business owners who once kept out of the immigration debate have recently thrown themselves into the middle of it. In the past year, they've held local press conferences and traveled to Washington to urge their Republican representatives to legalize the status of millions of undocumented immigrants. About 55,000 immigrants are believed to be living illegally in the South Carolina, according to 2012 estimates from the Pew Research Center. In Spartanburg County, most undocumented immigrants arrived from Central America and Mexico to work in the area's factories and fields. They say they consider South Carolina the perfect place to raise a family, yet they also describe work conditions where they are treated like animals and occasionally spit on. South Carolina's anti-immigrant reputation reached an all-time high in 2011 when state legislators passed a law that made it a crime to rent homes to undocumented immigrants and created a statewide immigration-enforcement unit. Though the enforcement unit still exists, the state has since agreed to nix the rental ban, along with a provision that required police to detain motorists suspected of being in the country illegally. Most Latinos in Spartanburg are in working-class immigrant families, living separate lives from the area's white and black communities. However, several local schools and hospitals have made an effort to bridge the language barrier by hiring bilingual staff and translating materials into Spanish. A handful of white evangelical churches have started sharing their sanctuaries with Hispanic churches, partly out of a desire to minister to the growing Latino community and partly from a need to share financial expenses. Their worship services are generally held at different times. Some of these white evangelical church leaders have also been working hard to change South Carolina's hard-line view of immigration. A large percentage of the state and its lawmakers are white evangelical Christians — the least likely religious demographic to support a pathway to citizenship for undocumented immigrants, according to a 2014 survey by the Public Religion Research Institute and the Brookings Institution. However, the survey also shows that a surprising 66 percent of white evangelicals across the country favor some type of legal status for immigrants without papers. Matthew Blanton has been meeting with pastors across the state to get them on board with the reform movement. He's the South Carolina organizer for the Evangelical Immigration Table, a coalition of evangelical Christians pressing for reform that includes a pathway to citizenship or legal status. Blanton says too many Christians in the Upstate view the issue from a Republican political perspective, instead of focusing on biblical teachings. "Their world view is formed more by talk radio than by scripture," said Blanton, who is based in Spartanburg. "That's a very dangerous thing." Blanton organizes pastor lunches and church workshops to discuss myths about immigration and biblical teachings that emphasize the importance of treating immigrants with dignity and respect. Progress is slow, he says, but about half of the 150 pastors he's met with since October have signed the organization's call for bipartisan immigration reform. Many of them have flown to Washington, prayed with Rep. Trey Gowdy in Spartanburg, and helped organize a town hall meeting in Spanish with Rep. Mick Mulvaney. At the February town hall meeting near Spartanburg, Mulvaney, a tea-party Republican, publicly expressed his support for a path to legal status for the first time. Gowdy, who chairs the House Immigration and Border Security Subcommittee, declined an interview request for this series. Last year, the Immigration Table aired several radio ads in South Carolina to counteract attacks against Republican Sen. Lindsey Graham's support for a pathway to citizenship. Jim Goodroe, director of missions for the Spartanburg County Baptist Network, voiced the message: "Christ calls evangelicals to compassion and justice, so please join a growing movement of Christians asking our political leaders for immigration solutions rooted in biblical values." Conservative radio-show hosts have attacked Goodroe and local pastors for their efforts, leading to angry calls and disapproving comments at churches. That doesn't discourage Jason Lee, pastor of Oak Grove Baptist Church in Spartanburg. He has organized church events to bring together his parishioners with members from the Hispanic congregation that worships in their building. "I do feel that this is the civil-rights issue for our generation," said Lee, one of the first pastors in the state to advocate for reform. "Something has to happen and I'm praying it will be a bipartisan effort."